I first had the pleasure of working with Shotsy owners (business partners and cousins) Lisa & Kate, last November for a TV shoot. Although I had visited the store prior to this, it was during my time pulling looks that I got to witness firsthand the cousins’ devotion to their relatively new store, appreciate their wealth of Vintage knowledge and admire the evident dedication to their loyal customers. I: You are a two person, family team. What was your relationship growing up and how did this lead to the connection required to run your business together? S: We are first cousins that practically grew up in each other’s houses, we were both very fixated with clothes and often used to joke about having a shop together. We were also fascinated by the clothes our Gran had kept, she was a seamstress by trade and we definitely got our passion for well-made clothes from her. We gradually started taking and wearing bits from our Gran’s house and without us even realizing it our obsession with vintage was born. Katie studied fashion and around the time she was finishing college Lisa was looking for a career change and the idea for our shop was born. We both liked the idea of a family business, but I think the main thing that drew us together is that we have really similar taste and we are both completely nerdy and derive so much happiness from well-made pretty clothes. Some people might look at a piece of vintage and think it’s just an old dress, but we definitely get caught up in the romance of it, it’s like discovering treasure and it’s magical to think that the person who first owned it all those years back had no idea somebody in the future would enjoy it all over again. I: That’s so true. We often think of the person that owned the clothes and what they were doing at that time but it’s so lovely to wonder about what they might make of seeing their dress-dance frock making is way down Temple Bar complete with a pair of studded boots below. I love that! So it was your Gran that influenced your style growing up? S: Gran’s knowledge of tailoring and dressmaking is vast, also we have seen her look at a vintage gown and gasp out loud at how beautiful it is, we know it’s the exact same feeling we get. She has never been especially well off and came from a working class background but that didn’t compromise her elegance. We find in general though the women of her era admirable. If you look at a photo of a Dublin street in the 40’s or 50’s everybody looks so well dressed compared to nowadays. It’s nothing to do with money as people were poorer then than we are now (hard to believe but true), they would have had far fewer items of clothing in their wardrobe but the quality and longevity of the garments was far superior to that of contemporary fashion. I: And did you have style icons that you tried to emulate when you were younger? S: We don’t generally try to emulate anybody, we feel that nowadays there are too many trends happening at break neck speed and too many people shouting about how we all should look, it’s all a bit much to take in. Vintage in a way is a reaction to that, in a city crammed with gigantic high street stores its nice to take a break and wander round a little store not knowing what you might unearth, as opposed to knowing that you will find a conveyor belt carbon copy of a look you saw in the last store. We are far more interested in looking at images of real women from the past wearing simple pretty frocks or beautifully cut tailoring than seeing what celebs are wearing in the magazines this week. I suppose we draw a lot of our inspiration from Google Images and Tumblr, and if we had to say some famous influences they would be Bacall, Bewitched and Bardot. Bacall for her draped dresses that hung so beautifully from her frame (and also our store is named after her character in the movie “How to Marry a Millionaire”, Bewitched the TV series because of the simplicity and prettiness of the dresses, the excessiveness in the amount of kitchen gadgets used in 1960’s American suburbia and the gravity defying hairstyles loaded with God knows how much hairspray! And Bardot, well there are no words really. I: Bewitched was absolutely one of my first aesthetic loves too! I particularly adored Samantha’s evil twin, Serena – remember her? A twin ‘cousin’ no less! Do you think one of you influenced the other when it came to exploration of Vintage clothing? S: It’s hard to pin point because when we were young and we liked dressing up in our Gran’s clothes we didn’t even know the word vintage yet. I suppose when Katie went to London to study for a year and Lisa visited on a few occasions we realised that vintage seemed to be more accessible over there and more a part of the high street. Lisa actually said as a joke we should open a vintage shop in Dublin and the idea stemmed from there. I: How did Shotsy start, what were your first steps? S: We registered the business way in advance of having a business plan, a loan a premises anything at all, but we did it just to make it real and not just a pipe dream and once we had done that it really spurred us on. Then when Road Records were closing down we bought their till from them. It was a bananas thing to do and it sat in a shed for a year but we knew it would happen if we kept believing it would. It was actually a big moment taking the till from the shed and bringing it in to the shop before we opened! I: That’s such a cool memory. Do you remember what your first sale was on that till? S: Yes! The first item we sold was a 1970s leather jacket with fur panels down the front. I:: How has Shotsy evolved since that first sale? S: We have been blessed to have a great first year in business, we see the same customers coming back in to us again and again and we have got to know so many people who love vintage as much as we do. It’s really interesting how some people have a really particular taste and you can nearly tell what dresses will catch their eye, while other people have really varied taste. The most exciting thing is that we have got to a position where we add new stock to the floor almost every week, sometimes a couple of times a week. That means that our customers are never bored and there is always something new for them to see which really adds to the fun of the shopping experience. We get a lot of positive feedback about the collection, and lots of people remark about how affordable everything is, which is something we strive for so it really means a lot to us to hear people say it. I: What has surprised you most about having your store? S: The age range of the customers – we get some teenage girls from about 13 or 14 onwards who really know their vintage, (we are a bit jealous of them though because if they start buying vintage now they are going to have a serious collection by the time they are 30!) we also get a lot of mature ladies who remember the clothes from the first time around and appreciate the quality. We didn’t think they would venture to Temple Bar but we are really delighted because vintage often gets a name as being a hyper-trendy, flash-in-the-pan way to dress, whereas we see it as a way to own beautiful affordable clothing that suits all ages, and these ladies are proof positive of that. Also the men of Dublin are far more dapper than we had originally thought, we didn’t realize that men were as in to vintage as they are, there really are some smartly dressed chaps around! Also something that has shocked us, and it happens occasionally, is when a customer tries something on and says something on the lines of “I absolutely love it but I wouldn’t have the confidence to wear it”. That type of statement breaks our heart when said by a grown woman because it’s incredibly sad to think she is denying herself something she would like because of what other people think. It would be understandable if somebody said this about a Victorian full-length dress with a bustle, most people would have difficulty finding an occasion to wear that, but it could be a simple hat or a knee length day dress they are wary of. We actually don’t know how people could live like that, it would seem like a life half lived to us! As we handpick everything we were worried initially that we would be upset when pieces we loved sold, but if the person buying the garment really appreciates the garment and you know they are going to treat it well and wear it and not hide it away and keep it going for years to come it’s a surprisingly satisfying feeling. We’ve definitely become better at finding a balance between what the customer is looking for and what we want to stock but we do keep finding ourselves buying things we like and sneaking them off the shop floor! I: What are your favorite eras for Vintage, personally and as Vintage traders? S: This is always a difficult one to answer because we like so many different styles and eras. We have phases where we get really in to a particular look, usually this is sparked off by a dress we find for the store or an image we see online. Some of our current fixations include 70’s prairie dresses – think “Little House on the Prairie” and in particular we love a label called Gunne Sax. But to go down one nerd level deeper we love when a decade has it’s version of a previous decades look – like for example the 1980s versions of 1950’s dresses – think Laura Ashley florals, or the 1960s take on 1920s dropped waists – think of the movie “Thoroughly Modern Millie” with Julie Andrews. If we had to pick our absolute favorite era we would say the 1950s and our favorite garment of all time is the classic 1950s dress with a full circle skirt – preferably in a floral print pattern, it’s such a beautifully shaped garment, it manages to be structured yet floaty, and completely feminine yet still very dramatic at the same time. The sad truth is though that 50s clothes are really in decline and getting harder and harder to get hold of. I: What labels are you always keeping an eye on for the shop? S: This is a funny one for us as obviously really famous labels such as Chanel, YSL, Lanvin, Balmain, Ossie Clarke etc are always sought after but our affection for labels tends to be focused on either iconic sixties London brands such as Cathy McGowan, or Bus Stop or Young Jaeger, or John Bates, or else not particularly famous labels from the fifties that say something really daft on them in that lovely squiggly fifties font. We once had a 50s handbag that had a label inside saying “The ultimate name in shoe coordination”. We have had a couple of dresses with a label saying they were for “chubbies” (scarily they all seemed pretty average sized by todays standards!). We are also addicted to the label resource on the Vintage Fashion Guild website, it’s a brilliant aid in helping you date garments and also gives great info about hundreds of not so famous labels. For example we currently have a swimsuit by a designer called Rose Marie Reid whom we knew little about, but from the label resource we discovered she was a Mormon swimsuit designer who’s business flourished in the 50s but went downhill in the 60s as she refused to design bikinis for moral reasons. We love learning this type of thing, it really helps the history of the garment come alive, we would encourage anybody who buys vintage to google their labels it’s great fun and really helps you appreciate how special the item is. We adore metal zips, well not even so much the zip but what it signifies, as nylon and plastic zips only came into common use in the mid to late 1960s a metal zip is a surefire way of dating your garment as mid century or older. It is amazing how excited we get at the sight of a metal zip in a dress, it may seem mundane but it means the dress is a really good find. It’s a cliche but of course we’d love some Biba, but being honest for ourselves more than anything! It really is incredibly sought after and seems to get more and more expensive every year. It’s got to the stage where even posters, playing cards, matches, any original Biba packaging is in demand. 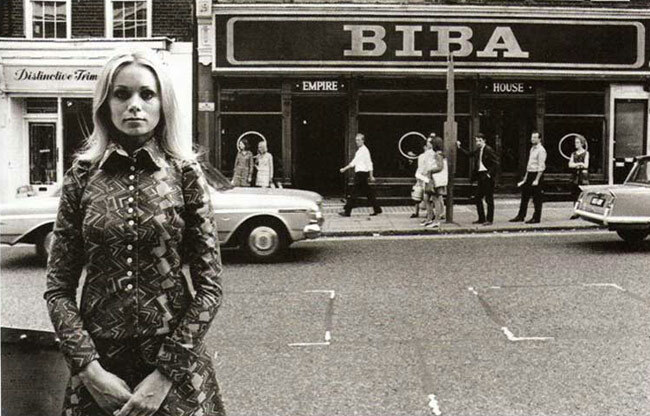 With Biba it’s not even about the aesthetic of the clothes as often they are not particularly pretty and the fabric was said to be so stiff and rigid that sometimes it was impossible to lift your arms in the dresses, but Biba signifies a turning point in clothes history and a very exciting time in the British fashion scene and that’s why it’s still so appealing to collectors. I: I completely agree about labels – researching the designer can give you even further appreciation of, and joy from, a Vintage piece of clothing. What one dress from history do you wish you had in Shotsy? S: There are literally hundreds of dresses from the past and from film that we covet, some very famous some less well known, the list would be very long! Marilyn Monroe’s pink dress from Niagara springs to mind! But one of the main reasons why we like vintage is that it continues to surprise us and challenge our perception of what the fashion of a particular era looked like. For example I think we all associate the fifties with full skirted dresses in pretty prints and pastel shades, then you’ll come across something from the fifties which is the polar opposite of what’s considered the typical fifties colour palette or cut, but it will be none the less beautiful. It is so refreshing to constantly discover pieces that you never would have imagined and fall in love with them, especially in a time when high street fashion is so mass produced and predictable. I: What has been the most exciting thing about running Shotsy together? S: In a nutshell being around really beautiful clothes, we work tirelessly to handpick our stock, it can be really difficult sometimes as you are essentially sourcing things from the past that are no longer in production, which is kind of a crazy endeavor, but when we see the clothes being tried on and appreciated by customers and going to good homes it really makes it all worthwhile, as corny as that sounds! I: Not corny at all! What are your favorite Vintage stores? S: We love Lucys Lounge / Se Si on Fownes Street in Temple Bar, it’s such a quirky shop and Dandelion who works there is a wealth of knowledge on mid-sixties and early-seventies fashion, we have some great finds we bought there it really is such a fun place to look around. Temple Bar has lots of vintage stores though including 9 Crows, Fluorescent Elephant, Fanci Schmanci Vintage and Golly Gosh Vintage. It’s brilliant that all these places are a stones throw from each other as it makes it a great vintage shopping destination. 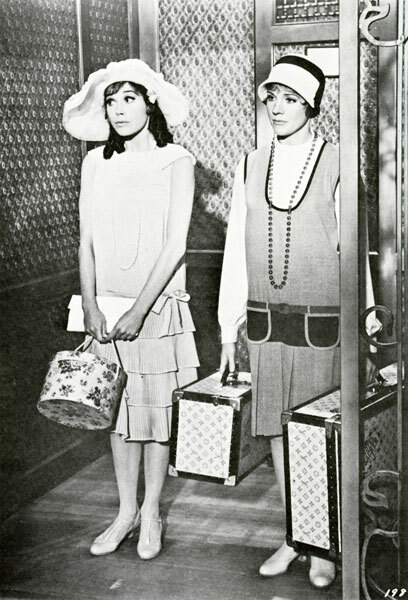 I: Finally, what tips do you have for anyone setting out on their first ever Vintage shopping trip? S: Go out with an open mind, don’t go out looking for the exact same thing you will find on the high street – remember clothes were cut very differently in the past. Be prepared to have a good root – the joy and pain of vintage is that there is only one of everything so things might not jump out at you straight away, but you never know what hidden gems are waiting for you so get stuck in! Keep your eyes peeled for metal zips – they mean the garment is mid-century or older and make it extra special. Ignore old sizes – they bear no resemblance to modern sizing, and try lots on, don’t take just one item in to the dressing room take armfuls if you want to get a good hit rate. Don’t be put off if something is a tad long or needs to be taken in, chances are the alteration can be done very easily or cheaply, ask a member of staff in the vintage shop for advice, it might not be nearly as big a job as you think. Abandon your fifteen year old self, worrying that you aren’t going to look like everybody else on the street or in the pub is not a healthy attitude, vintage is not fancy dress it’s everyday wear and it’s meant to be fun and not taken too seriously. Also remember that each vintage piece is unique, you are not going to bump in to somebody else wearing the identical outfit. When you buy an item on the high street as soon as you take it home and cut the price tags off it’s worth less then you paid for it. Whereas vintage doesn’t lose either it’s monetary value or it’s sentimental value in that way, if you look after it properly it will still be just as desirable if not more so in ten years time. Well now … if that isn’t just the most comprehensive advice a virgin Vintage-shopper could wish for! Thanks so much to the Shotsy ladies for their wise and colourful answers. Shotsy Vintage is located at Temple Lane South, Temple Bar, Dublin 2. They’ll also be at the Dublin Vintage Fair taking place April 22nd @ Royal Marine Hotel. « The World’s Most Romantic ….. Search Engine?